Appropriately, it was on St Peter’s Feast Day, June 29, 1885 that Mr Charles Campbell Ross the MP for St Ives laid the foundation stone of the new South Pier at Newlyn, and building work began. The South Pier was constructed on a line of rocks known locally as the Green Rocks, jutting out into the sea 720 feet, it left the mainland from Green Street, directly opposite the Navy Inn. The Newlyn Pier and Harbour Order 1884 had authorised the construction of a breakwater or South Pier at Newlyn that was to be 760 feet long. A new constitution was put in place for the management of Newlyn Harbour. The new managers or harbour commissioners were to be elected from men resident in Newlyn ‘within one-mile radius from a ring bolt, placed near the north-east end of the boat-house’ (presumably the one on the Green Rocks next to the proposed South Pier) and additionally they had to ‘possess one or more mackerel boats of a length of not less than 40 feet keel’ or ‘own property with a rateable value of at least seven pounds’. Of the 29 men elected, 12 of the men (just over half) were fishermen. These were Richard R Bath, Silas Bath, Thomas Keigwin Harvey, Stephen Hitchens, Henry Kitchen, Samuel Payne, Richard Pollard Jn, John Roberts, Peter Smith, William Gates Strick, John Oates Strick and William Tonkin. Most of these men had been at the forefront of the campaign to get a new harbour and most of them were owners or part owners of fishing boats. James Morrish was a boat owner but not a fisherman. The non-fishermen commissioners were John Blewett the boatbuilder; James Runnalls, a merchant; Peter Thomas, John Weeks and Richard Toman who were masons and builders; James Philip Cattran, Thomas Harvey, & Richard Boase Kelynack who were master mariners; George Marrack the rope maker; and Wladislaw Somerville Lach-Szyrma, the vicar of St Peter’s. Lach-Szyrma was the first chairman. There was a moment of jubilation on March 28, 1885, when Lach-Szyrma reported that he had been on the site with the contractor Mr Lister and he thought that they had reached a stage when they should congratulate themselves. 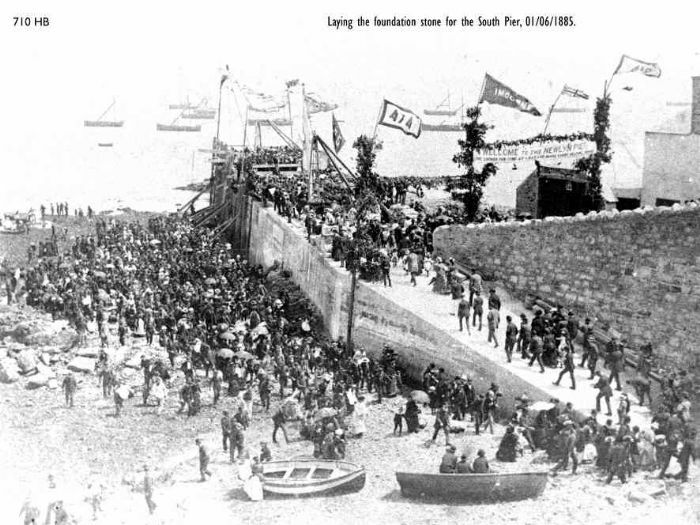 He said, ‘We had for two years been working to see what today witnessed, the work of constructing a new pier was begun, the lines were laid down and on Monday men will be employed in excavating rock and shortly the road and slipway approaches would be built preparatory to laying the foundation stone of the south pier’. He suggested that this ‘should be celebrated with good taste and style and a public holiday during the summer before the boats left for the north’. Richard Toman was the first clerk. 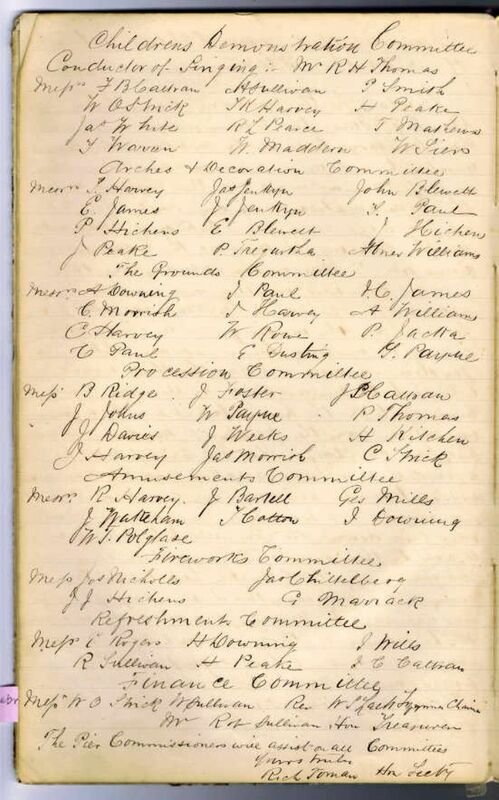 Toman was responsible for keeping a diary of the work of the Board in a grey cardboard-covered file of lined paper that begins with the names of the commissioners elected in 1884. This book contains the plans for the opening Ceremony. The date of the ceremony being fixed for the 29th June the Commissioners instructed their secretary to invite by circular a convenient number to act as a representative committee and of management for the carrying out the Inauguration Ceremony and the fete at Trereife and the display of Fireworks in the evening, to meet at the Commissioners Rooms at 7pm on the Saturday June 13. Most who were invited and were at home attended. Rev Lach-Szyrma was voted to preside over the meeting. The object for the calling the meeting being explained & that the Gentleman named to lay the stone would like it to be understood he did not force himself to do the honour but it was by a pure invitation from the people of Newlyn, it was put from the chair ‘That Mr CC Ross be accorded a welcome reception and we unanimously assist to make the ceremony a success’ carried unanimous. It was made clear that no plans were laid down. The committee to be formed were to act by their own views and make their own programme. Mrs Christie had kindly lent the grounds & the Season Band were engaged. It was necessary to precure this certainty in advance. All the names of those present were put on Committee and others signifying their willingness to work who could not attend. The programme was sketched and the subcommittees were formed as follows. Full descriptions of the work of these committees is listed and nine pages of details containing minutes of various meetings follow. But you will need to visit the Newlyn Archive to read the original: HM Log 1884-1890, Newlyn Archive 6122.